Want to live in Paradise? These people can help you find your dream home. 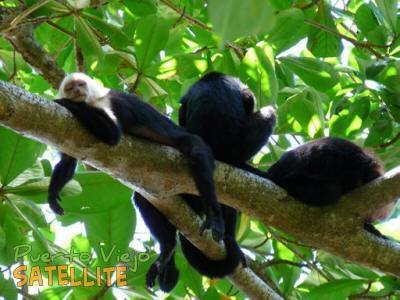 As you'll see around you, people from all over the world have settled in Puerto Viejo. Buying real estate in Costa Rica is probably not like at home so let an expert help you find what you need and sort through the paperwork. An Eco-Friendly Residential Development located near beautiful Punta Uva. Lots with land set aside for nature in an eco-friendly community of like spirits. Real estate office. Also offering construction, environmental consulting, architecture, insurance and legal services. Real estate agency for residential and commercial properties. Also offers design help, construction management and assistance with permits. Los Cielos community offers 1 acre buildable parcels with road and electricity to the property. We can assist you with further improvement of your property. A community of people sharing a vision of eco-sustainable living with nature. Lots with stunning ocean and forest views starting at $50,000. 1, 2 and 3 bedroom home-designs to choose from. Your dream home in the jungle for only $200,000 - $300,000 to use as a primary residence or a Costa Rica vacation home. Features 30 home sites; 21 lots are available for sale. Naturally secluded, conveniently located. Your own private eco-sanctuary in the up and coming neighborhood of Playa Negra only steps from unspoiled Caribbean beaches and minutes from town. This perfectly located enclave offers secluded splendor and lush tropical landscape with titled lots of 1000 m2 and larger. Financing available. Agency offering vacation rentals. Also offers services to property managers and investors to manage and market rental properties. I plan to retire in Costa Rica. Why not in Puerto Viejo? If of course I could purchase a piece of land there near the sea. Is there land available at reasonable prices. (3-6 hectares)? Land prices are fairly reasonable but don't expect giveaway prices. Prices for land are generally quoted per square meter. Land prices in the Puerto Viejo area can range from about $10 per m2 to $100+/m2. A hectare is 10,000 m2 and an acre is 4047 m2 so you can do the math there and see you'll pay at least $500,000 USD for a 5 ha piece near the coast. There are no local and gringo prices, everyone pays the same. The only difference between rules for Costa Ricans and foreigners have to do with the first 250 meters of coastline. In Costa Rican law no one can own that land but you can only get a permission to use it and that permission must be held by a Costa Rican. However, even that small restriction is easily overcome by establishing a Costa Rican corporation. Some cities have exemptions to the 250m rules but in the South Caribbean nothing is finalized. The other thing to keep in mind in the Puerto Viejo area is that much of the land is the Gandoca-Manzanillo refuge and so there are very restricted covenants about what you do on the land. Can anyone recommend a list of suppliers in the Puerto Viejo, Limon or San Jose and vicinity areas for purchasing low flow toilets, ceramic tile, wicker furniture, water catchment tanks, bamboo flooring etc., items one has to take into consideration when building/furnishing a home. Did you find what you wanted about COnstruction materials ? you can contact me if you need a Bid/ quote on Labour and Maaterials.